Junior forward Arnaldo Toro goes up for a lay up during Thursday's game against Siena. The Colonials lost to the Saints 69–61. 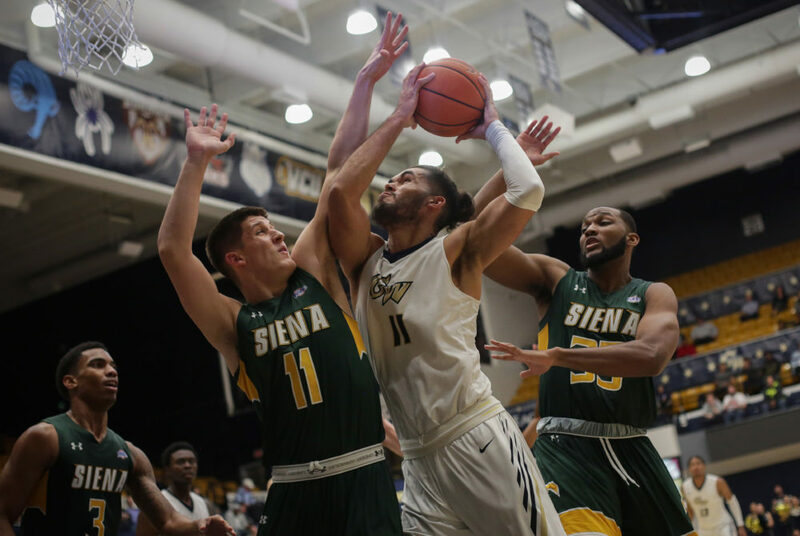 A late-game rally in the final nine minutes was not enough for men’s basketball to pick up a win against Siena Thursday night at the Smith Center. The Colonials (0–2) overcame a 10-point deficit in the second half to tie the game with seven minutes left in the contest, but Siena’s hot shooting from beyond the arc gave the Saints (1–1) the 69–61 victory. The game marks the first time since the 1988-89 season the Colonials have dropped their first two games of the season. GW held the Saints to 39.7 percent shooting on the night but allowed them to pick up 39 of their 69 points from beyond the arc on 13-for-34 shooting. The Colonials shot 42.6 percent from the floor on 23-of-54 shooting and 8-for-18 from the three-point line. GW was led by sophomore guard Justin Mazzulla, who put up a career-high 18 points and grabbed eight rebounds. Nolan followed with 17 points and nine boards. The Colonials were beat under the glass for the third consecutive outing after allowing Catholic to out-rebound them in an exhibition game last month and letting Stony Brook do the same Tuesday. The Saints grabbed 42 rebounds to GW’s 32 and pummeled the Colonials on the offensive glass, picking up 16 offensive rebounds – double GW’s total – and 18 second-chance points. Siena was led by freshman guard Jalen Pickett with 19 points – including 12 from deep – and six assists while redshirt senior guard Kevin Degnan contributed 15 points on 5-of-6 shooting from the three-point line. Sophomore guard Justin Mazzulla watches the basket after a teammate completed a free throw. The Colonials opened the night hot from beyond the arc, going 3-for-4 to earn their first nine points of the game. In his first career start for GW, redshirt junior guard DJ Williams picked up the first points of the night with a three-point shot. He ended the game with eight points, three rebounds and two assists. Williams sat out the team’s first game of the season due to a violation of team rules, according to an athletic department spokesman. Both sides went point-for-point and kept the score tight, until a layup by Siena sophomore guard Manny Camper put the Saints ahead 20–19 with nine minutes left in play. The Saints held onto that lead through the remainder of the first half. 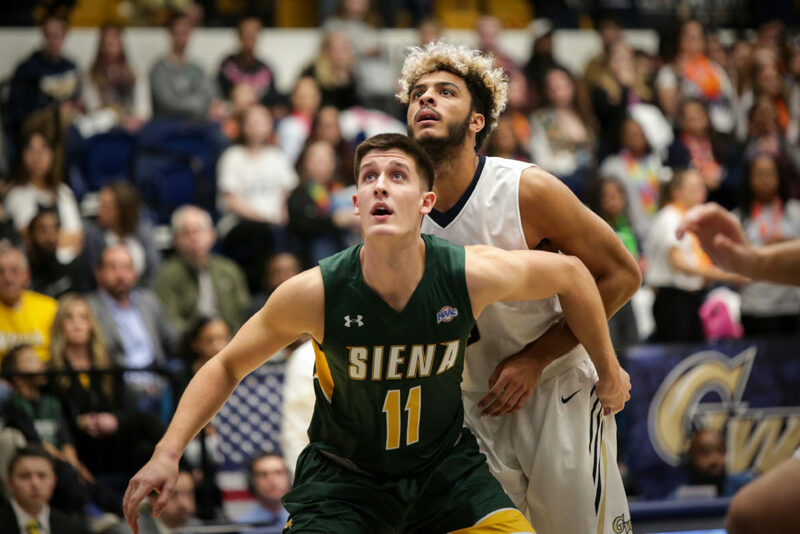 Siena continued on an 8–2 run to pull ahead 23–19, and GW struggled to stifle the Saints from the three-point line. With six minutes left in the frame, the Saints already sank six three-point shots and ended the frame 8-for-15 from beyond the arc. But the Colonials did not go quietly into the locker room. Back-to-back buckets by Mazzulla and junior forward Arnaldo Toro trimmed Siena’s lead to seven with 50 seconds left in play. Another three by Degnan pushed the differential to 10, but Nolan responded with a three of his own with two seconds left to get GW within single-digits heading into half time. The Colonials were shooting 52.2 percent from the field in the first half. GW opened the second frame continuing its momentum from Nolan’s three, continuing on a 10–2 run into the first three minutes of the frame to get within two points of the lead. The Saints responded with a 10-point run of their own, but the Colonials battled back to tie the game 55–55 with seven minutes left. 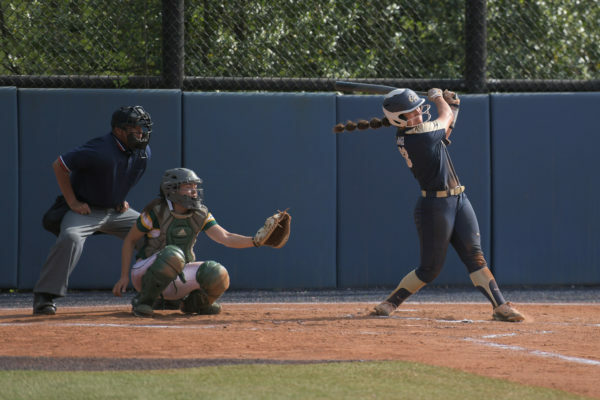 GW could not pull ahead, but kept Siena in its sights and the Saints’ lead remained in single-digits as the clock wound down. A layup by redshirt junior guard Armel Potter and a tip-in bucket by Toro brought the game within one point with a minute left. But another Siena three pushed the game out of GW’s reach for good. The Colonials return to action 2 p.m. Sunday when they hit the road for the first time this season to face No. 5 Virginia.